The entire range of Graphtec Intelligent Desktop Plotters produce superb resolution with unprecedented speed. 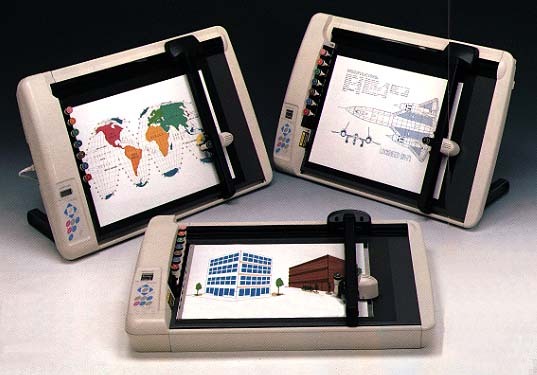 For the small office and home user, the MP5000 series A3 plotters are an excellent choice. They have outstanding features including: pen sorting, soft pen landing, automatic pen capping and automatic pen return. All members of the MP5000 family are compatible with: AutoCAD, CAD-KEY, Lotus 1-2-3, Harvard Graphics, VersaCAD, MacDraw, MICRO-CADAM and many others. 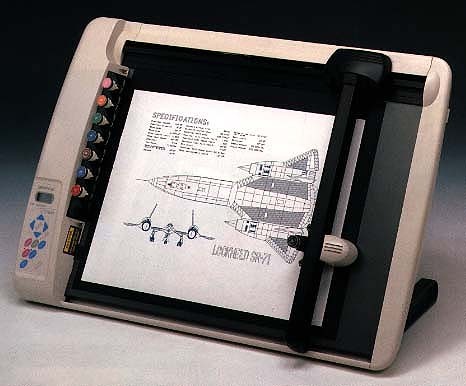 The standard GP-GL/HP-GL emulation commands are included across the MP5000 series, as is the dual - mode RS-232C/Centronics interface, which is automatically selected when you connect the plotter to your computer. At the top of the range, the MP5300 offers unrivalled speed and memory, with 40kB standard buffer memory, optional floppy disk drive and digital servo motor. The MP5300 is a showcase of intelligent features. It's "Curve Generator Function" calculates curves so that they appear to the machine as a sequence of finely graduated vectors, thus maximising the pen's deceleration, and substantially reducing overall plotting time. Setup is trouble free with three preset combinations of RS-232C interface settings. With the addition of the optional 1MB Floppy Disk Drive the MP5300 gives you the added power of saving up to 153 different plot files and enables "off-line" plotting, so that your output continues while your CPU gets on with other work.